As a parent you can directly contact a breastfeeding consultant when you have questions about, or problems with, breastfeeding. Alternatively, you can also be referred by a GP, paediatrician, paediatric consultation clinic, or receive a recommendation from a friend, or neighbour. Timely help and support can prevent breastfeeding issues to become either confusing or even insurmountable. A consultation provides the individual breastfeeding care that meets the needs of both mother and child. In many cases home-consultation is the most effective way for me to observe both mother and child. During the home-consultation I will ask a wide range of questions in order to assess the situation and propose a fit-for-purpose recommendation. This will be based on your specific request for help and ultimately you decide how you want to feed your baby. When required I can also examine the baby's mouth or the mother's breasts. An average initial home consultation takes about an hour-and-a-half and includes an aftercare check via telephone or a brief email or WhatsApp exchange. After my visit you will receive a report of my findings and recommendations. Many health insurance policies cover the costs of breastfeeding consultation, but only from IBCLC-certified consultants. Some insurance companies require a written referral from either a GP or midwife. Home-consultation The standard rate for a 60 min visit is € 100,-, which includes costs for travel (distances up to 20km) and parking, a written report, 1 x aftercare telephone call or brief email/WhatsApp exchange up until 2 weeks after the first visit. After this time, contact via telephone or email will be charged separately. For distances exceeding 20km an additional cost of € 7,50 will be charged. Follow-on consultation Subsequent house-calls are € 20,00 for each additional15 minutes. After a home-consultation you can pay either by (PIN-)card or with cash. You will then receive a digital receipt. After an email- or telephone-consultation I will send you a digital invoice. Payment is due within 14 days on IBAN NL34KNAB0256528306 of "Marjes Elling lactatiekundige". 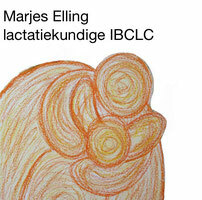 I'm a breastfeeding consultant IBCLC, which means that I have the internationally recognized certificate of the International Board of Certified Lactation Consultants, a professional organization with over 28.000 members worldwide. I'm also a member of the Netherlands Association of Breastfeeding Consultants (NVL) and I observe the rules and regulations of the World Health Organisation (WHO), including those covering privacy issues. Should the situation require information exchange with other care providers, I will always ask your permission first, or recommend you contact them yourself. If you're not satisfied with my services I would appreciate it if you discuss the issue with me first. In case we cannot reach an agreement you can raise a formal complaint with the NVL (see klachtenprocedure). Consultation are always by prior appointment. To make an appointment you can call me daily between 9:00 and 20:00. Please leave a message if I cannot answer the phone and I will call back as soon as possible to schedule an appointment. I am based in Rijswijk, but I also cover Delft, Nootdorp, Leidschendam, Den Haag, Wassenaar, the Westland area, Schipluiden and Den Hoorn. If you live further away we need to discuss this.